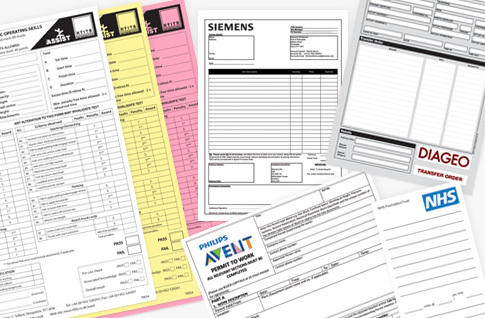 NCR Printing by Stationery Direct; we offer A5 and A4 NCR Pads which are both available with a choice of 2 part (duplicate), 3 part (triplicate) or 4 part sets (quadruplicate). All prices displayed below are for litho print (best quality print method) with single colour print to all parts. Each Pad comprises 50 sets and our standard paper colourway is White (top copy), Yellow (2nd part), Pink (3rd part) and Green (4th part). You may also specify your own colourway, which can include Blue (no extra charge). We print onto NCR paper (No Carbon Required) which means there is no need for the traditional messy blue carbon paper. NCR Pads, Books or Loose Sets? These are glued into sets and then glued again into pads. Each used set must be removed before you can tear away the next set, this means you cannot leave any of the duplicates in the pad for your records, they would need to be detached and stored elsewhere if required. These are stapled, spine taped and perforated; this means you can detach duplicates that need to be removed and also leave duplicates in the book for your records. These are glued into sets and supplied loose. Prices shown on this page are for Pads only; if you require Books or Loose Sets please contact us for a quote. What are NCR Pads used for? Our Pads are customised to your exact requirements and are a most useful and versatile business stationery item. They can be printed with any design of your choice and are commonly used as Order Pads, Invoice Pads or Receipt Pads. Typically a design will incorporate a logo, contact details, a form or table of some kind and an area for a customer signature, some also have terms and conditions printed to the reverse. They are suitable for any purpose whereby an instant duplicate copy of the document is required. There are many options available with NCR Printing and the process may seem a little daunting at first! Rest assured that we print thousands of these each week and we are happy to guide you through each step of the ordering process, just give us a call. Q: Do I need the messy blue carbon paper? Q: Your paper colourway is White, Yellow, Pink, Green, I need something different. A: No problem, we can collate in a different order and also offer Blue as a paper colour, there is no extra charge for this; you just have to let us know your specific requirements. Q: Will I be able to leave the completed duplicate sheet in the Pad? A: No, you will require Books which are stapled & perforated, please get in touch for a quote. Q: I need sequential numbering, can you start from any number? A: Yes, just remember to add this option to your order and let us know the start number required. Q: Can you number in any position? A: Yes, as long as you leave enough room we can position the sequential numbering anywhere. · Perforation, Drilled holes, Wrap around covers? · Books or Loose Sets? · 2, 3 or full colour printing? · Need a bespoke size?